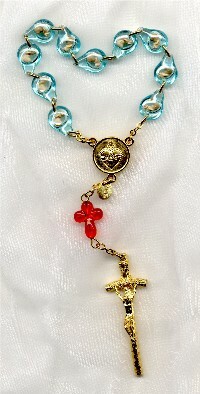 (ENGLISH) Small, One-Decade Rosary of the Unborn. Small, One-decade Rosary of the Unborn with ENGLISH paper booklet. 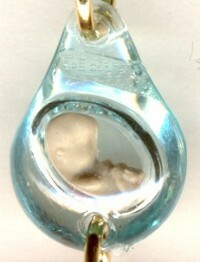 Light blue plastic Hail Mary teardrop beads hold an image of tiny unborn baby. Dark red Our Father beads are in the shape of a cross. Centerpiece holds the image of the United Hearts of Jesus and Mary. Papal crucifix. Each Rosary is accompanied by a free paper booklet in the English language: Our Lady Gives the World the Rosary of the Unborn.